This week the European Parliament called for a more gender-balanced chamber, as Spanish Prime Minister Pedro Sánchez defended feminism as one of the core values of the EU. The fight against gender violence and discrimination has been on the European agenda for a long time. Nevertheless, women in Europe are still struggling with gender pay and pension’s gap, gender-based discrimination and violence. According to the European Institute for Gender Equality, at least 33% of women from age 15 in Europe have been physically or sexually abused. But figures might be even higher since not all countries register gender-based violence as such. The Parliament itself is fighting for gender equality not only outside the institution, by calling for a European Strategy on Gender Equality, but also within too. Angelika Mlinar (ALDE) is the rapporteur of a resolution, backed by a majority of members, calling for gender mainstreaming in the Parliament, including in all areas of policy making but also in the political representation. “It is time to accelerate the implementation of all women’s rights instruments,” Mlinar told EURACTIV. “Governments should deliver policy-making strategies with gender equality values at its core. This is the meaning of gender mainstreaming,” she stressed. One of the paragraphs of the resolution was voted separately. The text demanded that gender training should be mandatory for MEPs and assistants, after the Me Too movement denounced dozens of cases of sexual harassment in the institution a few months ago. Although the paragraph in question secured a majority and will be pursued, almost half of the chamber, including members of all group and most of the European People’s Party MEPs, voted against. With the rise of far-right political parties, anti-feminist rhetoric has gained weigh in the public debate, in particular in countries like Poland, Hungary and Italy. And now, Spain is facing a similar battle due to the recent success of far-right Vox party in Andalusia, whose leaders have been spreading fake information, questioning the very existence of gender-based violence and framing the fight for women’s rights as a “dictatorship”. 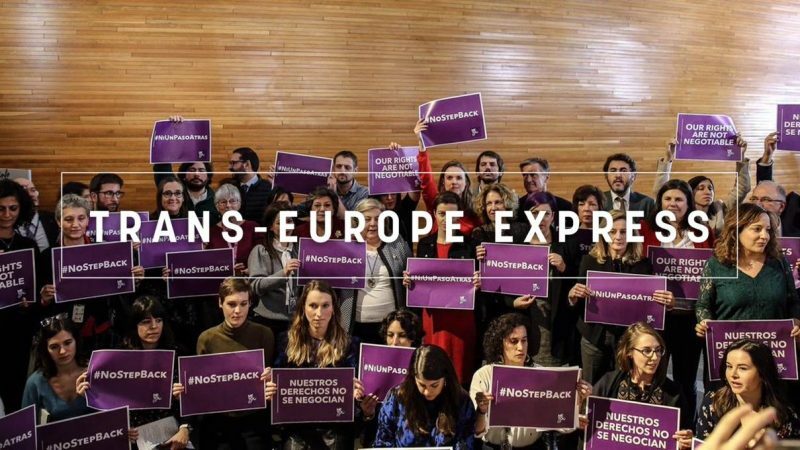 In response to Vox’s attempts to undermine women’s rights, dozens of MEPs, together with the European Commission’s Frans Timmermans, insisted in Strasbourg that there will be no step back in defending gender equality. “Our rights are not negotiable,” they said. “We must fight the ultra-conservative political parties, anti-feminist and religious groups, who systematically call gender equality into question and use religion, tradition or culture to legitimate violations of women’s rights,” Mlinar insisted. She defended the need to “keep women’s rights on the highest level of the political agenda, at all times,” so that not a single girl or woman is left behind. Me Too EP members are also insistent that this is not an issue that will go away and demonstrations are planned for every monthly plenary session. Law men. MEPs backed a proposal by the Commission that would link EU funding to rule of law breaches, in a move destined to split the bloc. Return of the Bunga. Silvio Berlusconi could be sipping Aperols in Place Lux in the autumn, after announcing his candidacy for the EU elections in May. Almost famous. Vladimir Putin rocked up in Belgrade and received a grand welcome. The Russian leader said Serbia is free to pursue EU membership and friendship with Moscow. Sulking Muscovites. Russia’s parliament voted against sending delegates or funding to the Council of Europe, prolonging an already protracted dispute. Czeching the books. EU auditors are in the Czech Republic to do some forensics on a possible conflict of interest between companies formerly owned by the nation’s PM and his current job. Greek heat. Alexis Tsipras survived a no-confidence vote but that didn’t stop Athens and Moscow trading barbs about the Macedonia name-change deal. Tear it down! Italy’s deputy PM joined the anti-Strasbourg seat bandwagon, calling it a “waste of money”. Elections news and views. Developments will keep coming thick and fast over the next five months, so stay glued to our live ticker, where you’ll find all the latest on the upcoming elections, both from an EU and national perspective.